Funny memories are kind of my jam. This was definitely less funny at the time, but it’s hilarious now (especially my reaction). 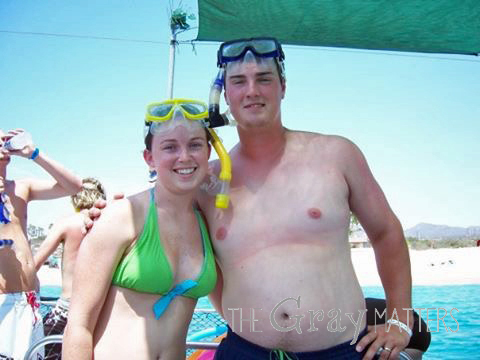 While we were on our honeymoon, we went on a snorkeling excursion. Mr. Gray insisted I take my wedding set off and leave it in the room. I locked it up in the room safe (with our cell phones; international plans were ridiculous back in the day) and off we went. As we cruised around, they took us to some snorkeling spots and then out to the beach near the Arch (we were in Cabo). The “sand” was more like smooth, tumbled pebbles. We threw it, ran our hands through it, and thought it was amazing. It was so different from any Texas sand. We hopped back on the boat to cruise back to the marina. 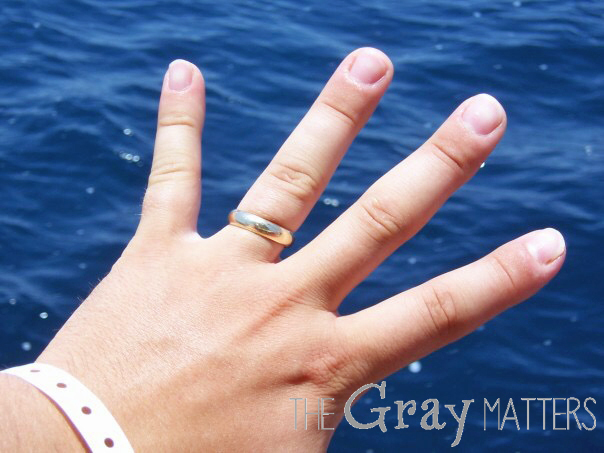 Mr. Gray started moving his hands strangely, patting his pockets, and looking all around. I couldn’t figure out what he was doing. Finally, I noticed it: his hands were bare. That’s right. It was Tuesday, his wedding band was less than three days old, and it was gone. I’ve never been more grateful I didn’t buy diamonds. Being my usual non-dramatic self, I burst into tears. He tried endlessly to get me to stop, he promised we’d shop on our way back to the resort and get a new one. I cried. I finally got it together. We arrived in the marina and went walking through the jewelry stores in the area. All the rings looked cheap. I finally decided to wait until we got home to replace it. Mr. Gray took it as we cruised over to the beach area where he lost it. So this is the last photo of the original wedding band that lasted only a few days. For what it’s worth, the second one has done pretty well. I mean it’s had a trip down the sink, but it was retrieved.